Learning how to day trade penny stocks has skyrocketed in popularity over the years as more and more people gain interest, but what are penny stocks and why are they so popular? According to the Securities Exchange Commission (SEC), the penny stock definition is any security trading under $5.00 per share. Most of these companies are relatively new, have a small market capitalization and haven’t established a track record as successful businesses which makes them speculative investments for traders and investors. So, what are penny stocks? Well, for starters, they are cheap which means you don’t need a ton of capital to put on a large position and they regularly have huge runs over a 100% or more in just one day! The allure of making these big returns has attracted all types of new traders and is why they have gained so much popularity. However, it is just as easy to lose all your money, or even more if your trading on margin, due to the volatility involved with penny stocks. That’s why it is important to understand how to trade them and what to look for before risking any of your hard-earned money! I was first introduced to trading penny stocks when a friend in high school made tens of thousands of dollars day trading penny stocks over summer break. This would have been around 1999/2000 and at the time trading online with TD Ameritrade was still a new concept. I always knew there was potential to make money in the stock market with a small account but I didn’t know how. I decided to open my own account but I was trading stocks like CAT, IBM, and AAPL. With my $1k account I made about $17 dollars. I was investing in the wrong stocks for big percentage growth. In order to grow a small amount of money ($500.00), we need to trade stocks that could double or triple in less than a week! That’ll never happen with FB or NFLX, but it can happen when you’re trading penny stocks! Many of you have seen the movie Wolf of Wall Street with Jordan Belfort. In that movie, they were trading penny stocks that are called Pink Sheets. These penny stocks trade over the counter (OTC), which means they are not listed on the NYSE or NASDAQ exchanges and are companies that don’t have to adhere to strict financial requirements required by major exchanges. To be listed on the largest national exchanges you must be fully transparent about your financials, and your stock must remain above $1.00 per share. Companies that are not willing or able to provide complete financial documentation, who cannot keep their stock above $1.00 per share, or who are in bankruptcy filings, will trade on the OTC markets. We do not trade penny stocks trading over the counter mainly because of the lack of liquidity along with the lack of regulations in the OTC market. They are far more susceptible to manipulation which makes them dangerous to trade. Listed penny stocks, or stocks trading on an exchange like the NYSE or NASDAQ is where we focus our attention. They have the ability to make huge moves intraday and are cheap enough to put on large positions. Stocks trading under $1.00 were almost always small companies struggling to find their place in the market and as a result those securities were very speculative investments for traders or investors. In this day and age, securities priced between $1-10.00 in many cases still represent some of the most speculative and risky investments. This is especially true for small companies in the Biotech, Internet, and Fintech sectors. These stocks can come out with news overnight that result in a 50% drop to the downside or a 100% squeeze to the upside. Anyone investing or day trading in these types of securities has to be prepared for the possibility of a total loss. Just for reference, when I took $583.15 and turned it into over $100k in 44 days, I was primarily trading stocks between $1.00 – $5.00. These stocks all meet the min listing requirements for the exchanges, which is important to me. If I’m putting my hard earned money into a stock, I want to feel confident the company isn’t going to disappear overnight. Tier 1 Penny Stocks: These are the penny stocks that we focus. They are listed on a major exchange like the NYSE or NASDAQ and are usually priced below $5.00 per share but can be a little higher priced than that. Tier 1 penny stocks are still speculative but less open to manipulation because they are required by the exchanges to provide financial information and are held to a higher standard than OTC penny stocks. Tier 2 Penny Stocks: Traditional penny stocks, in my opinion, are stocks priced between 1 cent and 99 cents. They aren’t below 1 cent (if you didn’t already know, stocks can trade at fractions of a penny). It’s not uncommon to see a stock priced between 1 cent and 99 cents that is still listed on the NYSE or NASDAQ. These companies will typically get a letter (which is made public), that they need to meet the listing requirements to have their stock above $1.00 within a certain amount of time. If they do it, the stock remains listed, if they can’t it will be de-listed and move to the OTC market exchange. However, it’s very important to note that stocks that trade above $1.00 will never have a spread less than 1 penny. That means the stock will trade 1.01 x 1.02, or 1.05 by 1.06, but never 1.015 x 1.017. When a stock trades BELOW $1.00, the stocks will trade down to fractions of a penny. Tier 3 Penny Stocks: Sub-Penny Stocks are stocks that are below 1 penny per share. So that starts at .0099. These will not be NYSE or NASDAQ stocks, so for that reason I wouldn’t trade them. These aren’t particularly noteworthy beyond the fact that the companies aren’t strong enough to even have their stock priced at 1 penny per share. Tier 4 Penny Stocks: Trip Zero Stocks (Priced .0001 – .0009) Trip Zero Stocks are priced with 3 zeros. These are stocks priced between .0001 and .0009 per share. As you can imagine these stocks after often used as vehicles for manipulation. Each increment the stock moves up is a 100% move versus the entry price of .0001. Many of the “hot penny stock” alerts are on sub penny stocks or trip zero stocks and primarily benefit the people who first bought the stock. If somebody buys 100mil shares at .0001 ($10k) and the stock goes up to .0010 they will sell with $100k in profits. Many of the stock promotion newsletters are sent by people who bought huge positions of these penny stocks. Many people would consider becoming a millionaire by day trading penny stocks to be the ultimate rags to riches story. By trading the cheapest stocks on the market, you can invest small amounts of money and see huge returns. But how hard is to make a living day trading penny stocks? It’s a lot harder than most would imagine. The allure of quick returns draws the crowds into the penny stock market, where many end up losing their shirts. At the end of the day, only 10% of active traders in the market will actually be profitable. The rest are giving their money away to better traders. After about 18 months of trial and error, I realized that there are a handful of stocks everyday that make big moves. The trick is learning to find those stocks BEFORE they make the big move. That became the basis for the momentum day trading strategy that I’m trading today. I apply this to day trading penny stocks & small cap stocks. Criteria for trading them: news catalyst , float under 100m and high relative volume. The first step to trading penny stocks successfully is you must be in the stocks that have the highest probability of making a strong run. But how do we know which ones will be the big movers? That’s where my scanners come into play. I have customized my scanners to find stocks that only meet my specific parameters which gives me an edge because I am only trading stocks that I know have the potential to make a big run. I use Trade Ideas to find hot penny stocks. 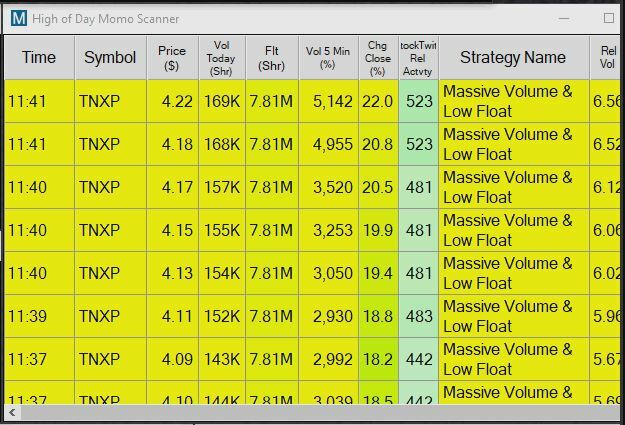 My two main scanners are premarket gappers and my high of day momo scanner. The High of Day Momo scanner is great for after the market opens. It picks up stocks that are surging up on high volume and with in our price parameters. If I don’t have any stocks that I am watching in the premarket then this will be my go-to scanner. 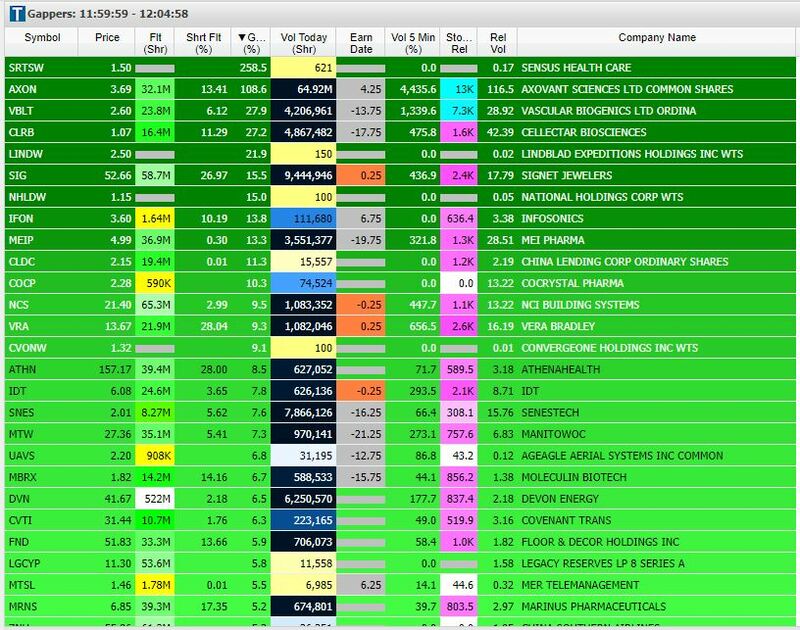 The Gap Scanner will show all of the stocks that meet my volume and price parameters but are also gapping up in the premarket, which tells me that they usually have some kind of news catalyst. I can then sort the scanner by how much volume the stock has had or by what percentage the stock is gapping up. I have three specific parameters that I use to look for penny stocks that have the highest probability of making a huge run. Parameter 1: Breaking News – First I look for stocks that are gapping up because of some kind of news catalyst like FDA approval or earnings but we want to stay away from any stocks that are being bought out because they usually don’t trade away from their purchase price. 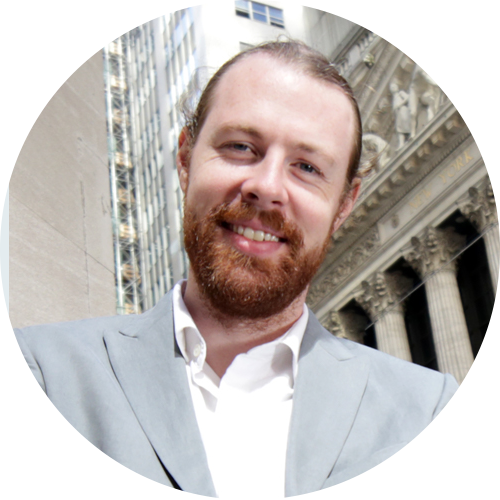 Parameter 2: Float – Ideally I want to the float to be under 100 million shares but under 50 million is even better. This is because when a stock has a small amount of shares to trade and there is a lot of buying interest then it could push shares up very quickly which is exactly what we are looking for. Parameter 3: High Relative Volume – I like to see the stock active in the premarket with solid volume. Usually stocks with news will be gapping up in the premarket on really good volume so I know right off the bat that this stock will have plenty of liquidity for me to trade with size. 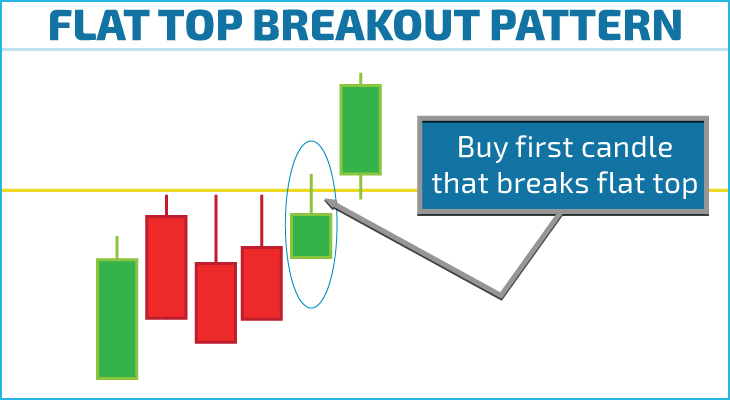 Once I make my watchlist of the best-looking stocks with the above criteria I will wait for the market to open and see if breakout over premarket highs for an entry or wait for a bull flag pattern. 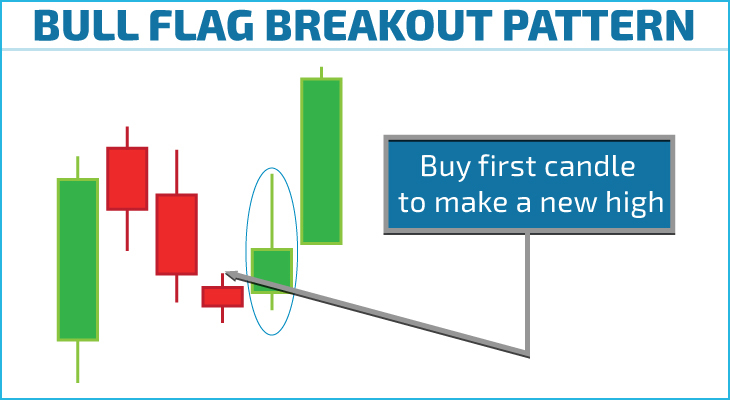 One of my all time favorite patterns is the bull flag pattern. It is super easy pattern to spot and it has a defined risk point where you know exactly when you are wrong on the trade and it is time to get out. You want to see the stock run higher and then have a light volume pullback, usually to the 10 or 20 day moving average on the 1 or 5-minute chart, where it will find support and buyers will jump back in to take it higher. The key to trading this pattern is waiting for volume to pick back up as buyer’s pile in and then jumping in with them. My other favorite pattern is a flat top breakout over premarket highs. Shorts will put stop orders in just above highs so I know if it breaks above it we will see their buy stop orders trigger which will help push shares higher. This pattern isn’t as easy to define risk so you can go about it a couple different ways. You can use the low of the candle that breaks out above the premarket highs OR you can use a set amount to risk like 20 cents for example. Are you a Penny Stock Day Trader or a Penny Stock Investor? In my experience penny stocks are so volatile, unpredictable, and subject to market manipulation, that being an investor is nearly impossible. You need to have a short term outlook in order to survive, and you need to be one of the first traders to get in and the first traders to get out with profit. Remember that a penny stock company can have a horrible balance sheet, awful fundamentals, and then spike up 200% on breaking news of a new partnership. For this reason, shorting penny stocks expecting the companies will go bankrupt is extremely risky. The fundamentals will matter eventually, but in the meantime, most investors can’t handle holding a position down 200%. I’m a penny stock day trader. This means I follow a few very specific rules about how to pick stocks and how to trade them. Day Trading Penny Stocks at this point is like riding a bike for me. As this point, I can make $100k in 3 months without breaking a sweat, but remember it took me years to get to this point. One of my favorite things is working with beginner traders in our Day Trading Courses because I know what it’s like to be brand new to the market! The reason working with beginner traders is so much fun is because I remember what it was like to be a beginner trader. I consider myself to be no different from beginner traders, the only difference is that I’m a little further down the road to success and I can look back at where you are today and know what it takes to get you to where I am today. Don’t Fall for the Promotional Pumps! Many OTC Penny Stocks become promoted at one point or another. These promotions often come with messages like “this stock will be the next Apple”. The reality is, the next Apple is not likely to come from the penny stock world. It’s more likely the next big tech company will start as a large company that IPO‘s well above the penny stock price range, and then continues higher. When you are buying penny stocks to hold in hopes that it will be the next Apple, you become an investor of one of the most speculative financial instrument on the market. It’s really important to avoid illiquid penny stocks. Most penny stocks trade only a few thousand shares a day. However, when a penny stock has breaking news, they will often trade at 40-50x relative volume achieving 5 to 10 million shares of volume on a big day. These are the days I’ll trade a penny stock. The good news is that there is a penny stock having a once in a year event almost everyday! This means as a trader there is almost always something to look at. Once a penny stock has met my standards for being worthy of trading (having news, volume, and being NYSE/NASDAQ listed), I’ll look for one of my Go To setups. These include Momentum, Gap and Go, and Reversal Trades. An important rule is that I should never over trade these stocks. For that reason, I only take the most obvious setups.I buy in the place where I expect thousands of other traders will also enter. These entries are based on support and resistance patterns. Once I have a profit, I sell 1/2 my position and adjust my stop loss to break-even. By quickly taking profit and adjust stops, I ensure small winners at the least. Occasionally I’ll get into a penny stock and get a big winner, but as a trader, I look for many small wins. It’s important that I don’t look to hit home runs, to make 10-20k in a single trade. My focus is to trade penny stocks almost everyday and have a daily goal of $500-1k/day. That means anywhere from 100-200k in annual profits. Many small base hits ads up over the course of weeks, months and years. My focus is making a living by trading, rather than investing in penny stocks. Many beginner traders start their trading journey with penny stocks. We actively encourage traders to AVOID penny stocks and instead trader stocks priced between $3-10.00. These are stocks that have the potential to make 20-30% intraday move, but retain the security of being listed on NYSE and NASDAQ. As a result, they are more popular among traders and are often considered safer vehicles for trading and investing. As you probably already know, I’m an active trader of stocks priced between $2-20, and occasionally trading stocks as high as $200. I trade stocks reporting breaking news such as earnings, contracts, FDA announcements, or other PR’s. I look for that stock that is having a once a year event because that’s the stock every day trader will be watching. Trading penny stocks isn’t for everyone. It requires a certain amount of risk tolerance along with the ability to react quickly in uncertain situations. 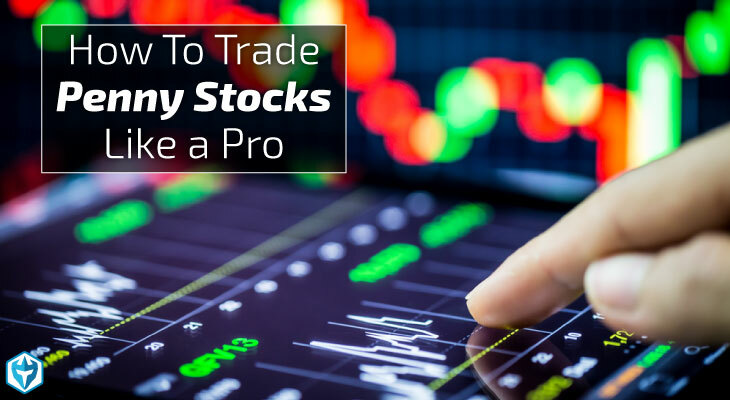 However, if you think you have the skills to day trade penny stocks then you need to make sure you educate yourself on how to trade them along with money management techniques to avoid losing all your hard-earned capital. I’d also recommend starting off in a trading simulator where you can practice trading without risking real money. This will get you use to how fast moving stocks trade and will also give you practice using hotkeys, which are a must have when trading penny stocks or any other type of momentum based strategy. Hope this guide helped you on your journey to becoming a successful trader but let us know if you have any questions in the comments section below! Great write up! Really happy with the quality of the information you provide, keep it up! 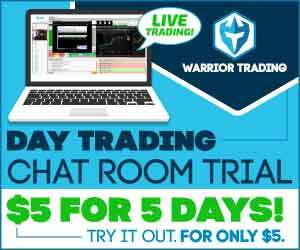 I’ve never traded penny stocks but is something I am interested in and I’ve heard a lot of good things about Warrior Trading. I’ve been following their youtube videos and really like Ross’s demeanor and patience. I tried trading penny stocks on my own but failed miserably. Warrior Trading has helped me grow as a trader and I am much more confident in how I plan my day. Trading is tough so I’m glad I found the right help! Signed up yesterday for their Warrior Pro class. Really excited to get started on the material and learn from these guys. Been doing a lot of research on trading penny stocks and these guys look like they have the tools and resources to really help me out. I would like to invest $1000.00 in what people are calling trump stocks. Wow, that’s really impressive Ross. Been following you for a while now on YouTube and Twitter and really like your material and the way you educate. Thanks for the write up Ross! You always provide great information and you have truly improved my trading with your great insight and exceptional patience! Went to the free chat today and it was pretty awesome. Guys are really professional and the room is well run. Gonna sign up for sure! Nice job Ross! Been following you for a while now and am really impressed with how well you have been trading. Keep up the good work! How does eSignal compare to TC2000? Looks like you use eSignal but was just wondering because TC2000 is cheaper. Wow, that’s really impressive Ross. You have been a great source of inspiration to me and have kept me going. Been trading full time for almost two years and have finally started to find an edge thanks your training and the Warrior Trading community. Does anyone know what broker Ross uses or recommends? Looking to start with their Warrior Pro course soon and wanted to get an account set up. Hey Andrew, he uses Speedtrader but also recommends Suretrader and Tradezero for traders who can’t afford the $25k required for day trading. He also uses eSignal for his charting. Awesome job Ross! Been following you on YouTube throughout this challenge, quite impressive. When will you guys be having another webinar? Great write up and very impressive work Ross. Been a true inspiration to newbies like myself. Nice job Ross! You the man and a true inspiration to use newbies! this is all great but where do you find the info about new penny stocks? Where can i read up to find this information? Looks like you started 2017 with great returns. I don’t know how you handle the pressure of trading in front of thousands of traders everyday but please keep it up. You have taught me so much and really appreciate everything you have done for trader education! 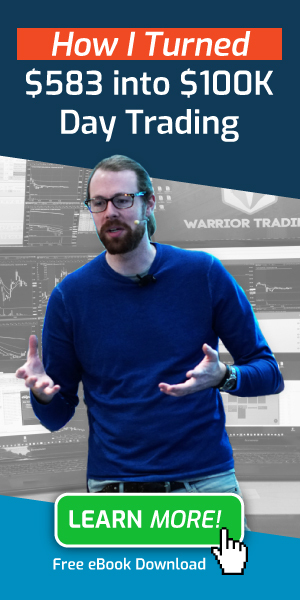 How can I get involved with Warrior Trading? I am completely new and i’m not sure where to start. What’s. Commission carged for penny stocks? I am currently trading penny stocks. Attempted 4 years ago when i was 22 and lost my 18k down to 800 dollars until i finally started to wise up. This year so far turned that 800 dollars into 39k. I’m one of your students and the quality and content of the education is second to none ! What is the best company to open an account with? Looking for long term investment. Stock that can remain and grow with little withdrawal and be transferred to my son later.